Recently I’ve sometimes felt at a loss to know how to start connecting with my daughter. When she’s whiny and grumpy, or if she’s non-co-operative, and doesn’t want to let me get her dressed or brush her hair, then laughter and play is the best way to shift her mood, But recently I can’t always think of things to make her laugh, or feel in a playful mood. If I don’t feel in a good mood myself then it’s almost impossible to help my daughter feel better. Now I have found the perfect solution, dancing! I’m not sure how exactly it started, but we have been dancing almost every day for the last few weeks. We put on my daughter’s favourite song, (the Locomotion), and start moving. It doesn’t involve me having to think up some way to giggle or initiate play, it’s as simple as just putting on our ‘dancing song.’ And what happens is that play and laughter naturally follow. My daughter will try to pull me across the other side of the room, and I’ll resist at first and then fly across, which starts her laughing. 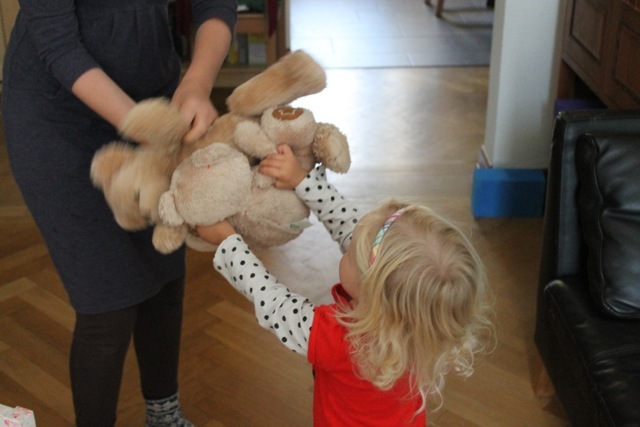 Or her teddy’s like to dance too, and they’ll start getting a bit ‘rough’ and ‘fighting’ on the dance floor. This has made her laugh a lot, and help her release some tensions about playing with other children. She recently started a new playgroup, which has triggered a lot of fears, so I know the chance to do some playlistening, and be strong and powerful on the dance floor will help build her confidence. The best thing about dancing, is that my mood shifts along with my daughters. As parents, we can get weighed down with our responsibilities, and it can be hard to be what our children need us to be; fun loving! Dancing is a simple way to get your body moving, your heart racing, and start to remember what it means to be fun and in the moment. In a recent study researchers looked at what happened when 14 month old babies were bounced in time to music with an adult, and then tested to see if they would pick up a dropped item and hand it back. The bounced babies were more likely to help out, which the researchers took as a sign that having shared experiences makes you more altruistic. This really sums up the Hand in Hand parenting approach, that if we want to raise co-operative loving, children, then it’s as simple (and as challenging! ), as connecting with them, offering them warmth, love, play, and perhaps some dancing! Punishment and reward, don’t help children to become genuinely co-operative, because they are based on children’s desire to get what they want, or avoid what they don’t want. To allow the children the gift of staying in touch with their natural, altruistic selves, we need to show them that we aren’t going to use our power to give or take away to control them. We can just be loving and connect with them. It’s not always easy, we frequently run out of patience and energy. But Hand in Hand parenting supports parents to overcome the hurdles that get in the way of us being the fun, playful parents we want to be. Could 5 minutes of dancing a day before school, or after dinner bring more joy and laughter into your family life? Try it and see! Go for it Kate 🙂 We parents are people too, and we have a right to our own joy! Plus, it is really lovely to do something like play listening in dance; we take turns and follow the other in movement and it is really an interesting way of getting into the ‘body’ of the other and of showing empathy via movement.